On September 5, the Communist Party’s anti-corruption agency reported that the head of the agency Wang Qishan would be carrying out an investigation in Hunan Province. Wang had previously been out of the media spotlight for about a month. Context: Whenever Wang gets official media coverage after going dark for a period of time, high-ranking Party officials often get purged. 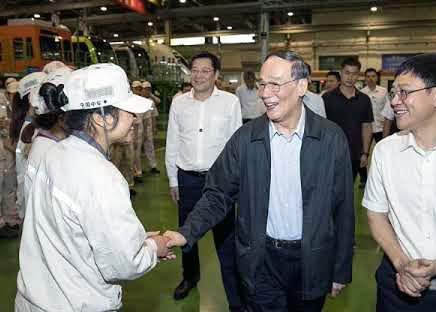 In July, former Politburo member and Chongqing chief Sun Zhengcai was investigated and replaced after Wang “reappeared” in the news earlier that month to promote Xi Jinping’s poverty alleviation program. Zhou Qiang was the Jiang faction’s Supreme Court plant during the last People’s Congress in 2012 but failed to make the delegate list of the upcoming 19th Party Congress in October, a very irregular development that spells trouble for the seating Chinese chief judge. In August 2016, Zhang Chunxian and Xu Shousheng were prematurely relieved from their provincial secretarial posts in Xinjiang and Hunan Province respectively by Chinese leader Xi for their connection with Jiang. Personnel control is a crucial part of Xi’s power consolidation. Expect Xi and Wang to press on with their anti-corruption campaign until the Jiang faction is eliminated.